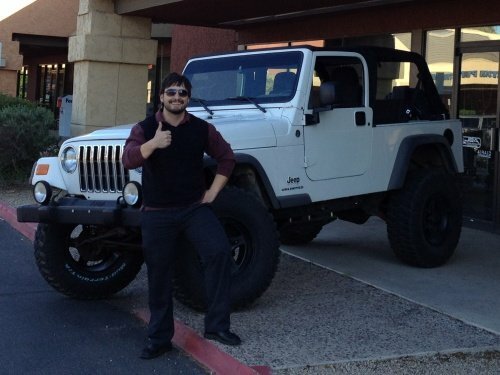 Hello my name is Chris Vincent and I have been an avid Jeep enthusiast since I was a kid but did not own my first rig until 2009 when I purchased a brand new 2009 Silver Unlimited JK Rubicon. So my 2005 Jeep Wrangler Unlimited LJ is my second Wrangler and is a much slower build due to being in a different place in my life. I have had it for a little over a year and have only made one major modification to it. I spent more money on parts / accessories for my 09 JK Rubi in the first year than I have on my entire LJ. That being said here is what I have done. I purchased my White 2005 Unlimited Automatic in March of 2012. A standard LJ had been my goal from the start and the fact that it was in Arizona and white in color was a bonus as I had been looking up and down the entire western United States. Having wheeled the crap out of my 2009 I knew that I wanted to build a trail only rig with an LJ body. I liked the JK Unlimited size and space for camping but when it came to straight wheeling the width and wheelbase were not ideal for my style of technical rock crawling. I sought out an LJ for a little bit of the size with the TJ style and at a lower cost. 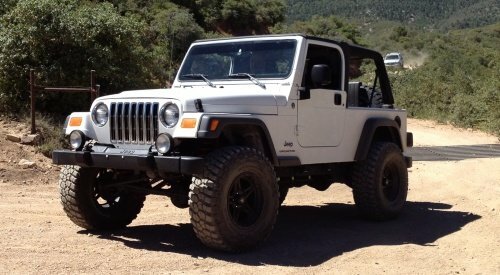 You can read more about my feelings on driving the LJ every day and wheeling it in my Review. The reason I did not go for another Rubicon is that even though I loved my 09, I knew eventually I would outgrow the axles, gearing and t-case low range. I knew eventually my LJ would be a beast running 40s and an Atlas, among other things like a supercharged engine or Hemi-swap. I was looking to get a bargain LJ and that I did. I found my rig after over 4 months of patient searching. It was on one of those mix-and-match sketchy part of town lot dealers of all places. Normally this would be “no good”, but when you’re paying cash and know what to look for in a Wrangler it can be a good deal. My rig was a huge “bone” for the dealer as it had a few glaring issues that would turn the average buyer off. First the soft top was really messed up with a rear window that wouldn’t fully zip. This was no big deal for me because as an AZ resident (and now Northern California inhabitant) I was planning on running a Safari top 95% of the time. Which I still do when it rains BTW. There were also some other common issues for a vehicle 7 years old such as some leaky hoses and gaskets. On top of this the exterior was not really average buyer friendly either, there were some ding and dents, severely faded fender flares and overall it looked kind of grimy. Again not a big deal for me, knowing the flares would come off or be replaced eventually. Plus I was planning on putting this thing through some major brush weekend 1 so who cares about a few dings and scratches. Long story short I ended up paying $10K for the LJ while trading in a really piece of crap Toyota Camry I had been driving with bald tires to pay for taxes, title, registration and dealer fees ~ $1,000. (Why I had a Camry is another story) Overall I ended up getting it for $1K under the low end of the spectrum which was great. I should also mention that upon looking on CarFax the rig was a rental in Hawaii prior to coming to this lot. Normally I would be scared off by a rental vehicle but not a Wrangler because the renters simply don’t wheel the vehicle like I would. There were no banged up parts on the undercarriage so I can live with a somewhat neglected exterior. 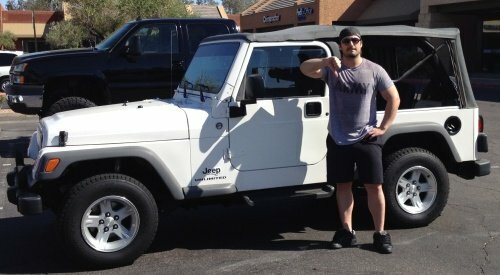 Having done a majority of the work on my 2009 I opted to get the vehicle lifted by a shop (Desert Rat Offroad in Tempe) as I didn’t want to mess with it and really didn’t have the place to do it anymore. I opted for a mid-range Rancho short arm 3.5” kit with Rancho 5000 shocks. I did this for two reasons. First I wanted something that would be functional for moderate wheeling while I built the rest of the Jeep before moving to a more serious long arm kit with coil overs. Second, there was a $500 rebate on the kit at the time. I also had Desert Rat put on a 1” body lift and 35” inch BFG KM2s with some generic black aluminum wheels. And this is basically where I sit today nearly 16 months later. Besides a Safari Top, Marathon Seat Covers (which i highly recommend had them on my 2009 as well), grab handles and pulling the fogs along with the plastic bumper caps I have not done much else to the Jeep. I want to do more but the Jeep does quite a bit as is and I simply am not ready to dump more money / time into it yet especially because once you start it is hard to stop. I will however in the next few months be putting some rock rails on so I can go run the Rubicon a little safer while taking some more aggressive lines. Well that is it for now but I will continue to update this page as I make changes or add customizations to this rig. Thanks for reading and be sure to check out my review of the rig where I talk about the feel of it wheeling and driving around with larger tires and stock gears, etc. For now check out a few pics of my rig in some modest action. I have a 05 unlimited 6 speed. I plan on lifting it and was wondering what size lift and tires you recommend. It’s my daily driver and the most off reading that I will be doing is on the beach. 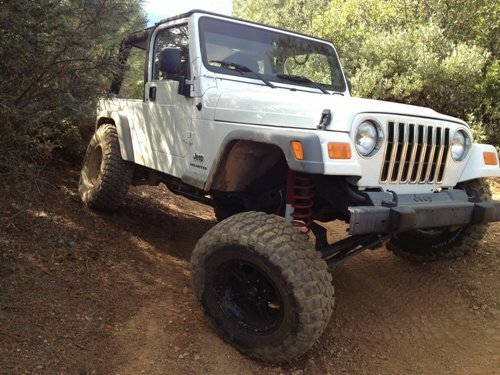 A lot of LJ owners agree that a 3″ lift and 35s is the standard. It is what I have on my Jeep and and I think its a good balance. You could go 33s if you want to save a little on Gas Mileage but the biggest difference will come in rather you go with Mud Tires or All Terrains. Hey Man, what are the total specs on the wheels and tires? Jeremy – what do you mean by specs? Brand, size…? Awesome story, thanks for sharing. 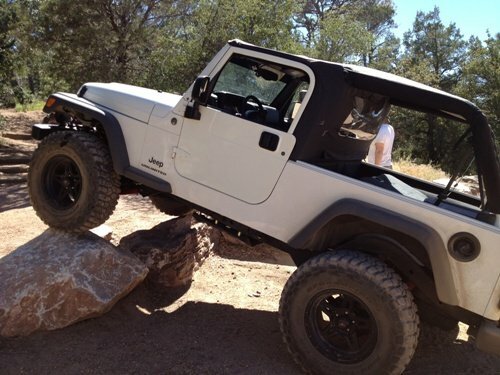 When looking for a TJ Unlimited, did you consider getting a Rubicon version off the bat?